While my site is all about marketing and selling your screenplay, you should most definitely not neglect the craft of screenwriting. The better your screenplay is, the easier it’s going to be to market it. This post covers some general guidelines that will hopefully help you improve as a screenwriter. When I first started out as a screenwriter I went out and read a ton of how-to books on screenwriting. I highly suggest you do the same, if you haven’t already. These books will give you a solid understanding of the craft of screenwriting. Save the Cat by Blake Snyder. Click here to buy it from Amazon.com or click here to read my review of the book. Screenplay by Syd Field. Click here to buy it from Amazon.com or click here to read my review of the book. The Art of Dramatic Writing by Lajos Egri. Click here to buy it from Amazon.com or click here to read my review of the book. Screenplay and The Art of Dramatic Writing will give you a firm grasp of the fundamentals of screenwriting and drama in general. But Snyder’s Save the Cat walks you through the entire process of writing a marketable screenplay. I highly recommend that you follow this process as closely as possible. I also highly recommend his other two books, too, Save the Cat! Goes to the Movies and Save the Cat! Strikes Back. In addition to reading a ton of how-to books, you should also be reading a ton of screenplays, produced and unproduced, good and bad and everything in between. Reading other screenplays gives you a feel for what a good screenplay looks and feels like. It’s a complicated equation and all the how-to books in the world won’t give you the answer. Reading actual screenplays will. One of the most common questions I get from new screenwriters is, “How do I know if my screenplay is good enough?” If you have to ask the question, it usually means that your script isn’t good enough because you haven’t put in the work to be able to tell what a good screenplay looks and feels like, and you haven’t put in the work to write a good screenplay. If you had, you would know. So start reading! There are many online resources that have screenplays to download for free like Drew’s Script O Rama, The Daily Script, and Simply Scripts. These scripts are free to download so there is nothing stopping you from reading thousands of screenplays except you. Ultimately there is no substitute for sitting down and writing. And once you’ve written you need to get feedback and then start re-writing. This is the hardest part of the process and there are no shortcuts. You just have to put in the hours and do the work. It can be frustrating, boring, and tedious, but it can also be exhilarating, fun, and very rewarding. If you have a lot of trouble with the writing part of the screenwriting process I would say you’re in serious trouble and you might consider looking elsewhere for fulfillment and a possible career. While it’s not easy for anyone, it’s not impossible for the ones who will succeed. When I was working a fulltime job I was able to churn out 1 or 2 feature length screenplays per year. If you find that you simply can’t meet that quota, screenwriting may not be for you. I don’t think there is any shame in this as there are plenty of other fulfilling, meaningful things to do in life. Don’t beat yourself up about it. Try and find something that’s better suited to your particular talents and interests. If you can’t put pen to paper and churn out a reasonable number of finished screenplays you’re going to have a hard time giving yourself a real chance. 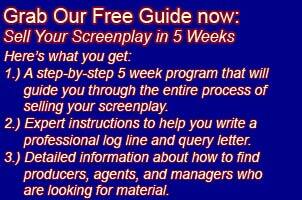 Each screenplay you finish and send out is another potential success. Look at a finished polished screenplay as another entry into the screenwriter lottery. If you have one script, okay, but if you have two scripts you’ve just doubled your odds of hitting. And if you have 4 you’ve doubled your chances yet again. If you’re only able to write 1 screenplay every 5 years or so I don’t think you’re giving yourself enough opportunities to connect with producers. If you’re churning out 2 screenplays per year at the end of 5 years you’ll have a healthy stack of 10 screenplays to send out and possibly gain traction with. In addition, and most importantly, the very act of writing makes you a better writer. Intelligent people can debate which marketing strategies are best for writers. Intelligent people can debate whether you should pay for feedback or not. Intelligent people can debate whether or not online courses, books, or seminars are worth the money or not. But putting in the hours and putting words on paper is never debated. It’s the irrefutable law of becoming a good writer: you must write a lot. So now you’ve written a first draft of a screenplay and you need feedback. Getting (and giving) feedback is one of the keys to improving as a writer. If you move on to the next project too soon you’re missing a whole level of writing skills that are crucial. So how do you get constructive feedback for your screenplay? You need to network with other writers. Living in Los Angeles is a big advantage when trying to find other writers to network with. I’ve lived here for more than 15 years and at this point in my career I have several good friends and colleagues who I can send my screenplays to for high quality feedback. But there are other alternatives if you don’t live in Los Angeles and can’t move here. There are tons of online screenwriting forums and blogs. I suggestion you join some and start networking. After you find someone who seems to be smart and hard working (like yourself) it shouldn’t be hard to to simply swap screenplays and give each other notes. I’m biased (obviously), but I highly recommend my own forum for this sort of networking. While it does cost a little bit of money, it’s been priced so that anyone can easily afford it. The nice thing about a paid forum is that because there is a paid element to it, it weeds out the less serious people so the level of people in it is much higher. So If you’re looking for a good screenwriting forum to join, please consider joining mine. You can learn more about it here: Screenwriting forum. There are a lot of other benefits to joining, too, which you can learn more about here: Screenwriting tools. Another great way that I get feedback on my screenplays is through a writer’s group. My group meets once per week in Studio City. Three writers present around 25 pages of script. The pages are read by professional actors in a sort of table read environment. Then the other writers in the group give notes to the authors of the pages that we’ve just heard. This really is an excellent way to give and receive feedback. You get great notes and you hone your own ability to give notes. If you live in Los Angeles and would like to consider joining my writers group, please check out the group’s webpage which can be found here: Deadline Junkies. We’re always looking for good writers to join us. You must be available for every meeting, not just the ones where you’re presenting, so it can be a big commitment for some. Auditing is free and encouraged so feel free to stop by if you’d like to check it out. If you live in any decent sized city there is most likely other screenwriters in your area, so try and find them and either join their group or create your own. I’ve set up writer’s groups in my paid forum, so again, if you’re stuck trying to find a good writers group consider joining my screenwriting forum where I might be able to get you into a group in the forum. Another quick and easy way to get feedback is by simply paying a screenplay consultant. There are dozens, if not hundreds of them out there. Just Google the words “Screenplay consultant” and you’ll find many. I’ve used a few of them over the years and have never had a bad experience. You should compare a few of them and ask for references. Price varies dramatically depending on the experience of the person giving the notes and the level of detail the notes will cover. I usually like to purchase the cheapest service a consultant offers first to see if I like them and to make sure I’m getting value for my money. If you’re looking for high quality notes at a very reasonable rate, I highly recommend Script Quack. They’ve given me tons of great notes over the years (the founders of the service are in my writer’s group!) so I really can’t say enough good things about them. They give a discount to my readers so just enter the discount code “sellingyourscreenplay” (without the quotes) on the discount page which can be found here: http://www.scriptquack.com/discountpage.html. They have a variety of packages and deals, so just choose the one that suits your needs. They’re all worthwhile. If you spend the time and energy reading and educating yourself and writing a ton, combined with a solid marketing effort, I genuinely believe that you can find some success as a screenwriter. It’s a very complex business and there are no guarantees, but if you stay focused on the processes you will slowly make headway.